Shropshire Council publishes ambitious housing plans – can we deliver? Shropshire Council has published its draft plans for development in Shropshire up to 2036. 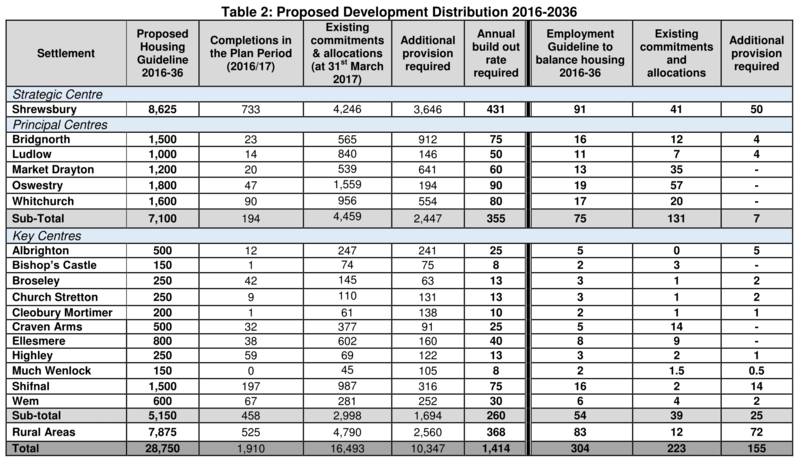 In its consultation on preferred scale and distribution of development, the council is proposing that 28,750 dwellings are built between now and 2036. Ludlow will be expected to provide 1,000 new homes over that period, a build rate of 50 homes a year, along with space for an additional 11 jobs a year for the growing population (other jobs will be created in existing employment space). We will only need to find land for an additional 146 homes because large unplanned developments have been approved at Foldgate Lane and Bromfield Road, and hundreds more are at various stages of planning. Our problem in Ludlow is that we can’t get homes built. Across the county, the council wants to build 28,750 homes, the highest option, despite 60% of respondents to an earlier consultation wanting a lower rate of growth. This means we must build the equivalent of a new Shrewsbury by 2036. It means a delivery rate of 1,430 dwellings each year. In 2016/17, Shropshire completed 1, 910 new homes, so this initially looks feasible. But this was boosted by above average completions in Shrewsbury and Shifnal. Over the last five years, the county has averaged just 990 new homes a year. Over the last ten years, 1,180 new homes a year. So, the new targets, if they are approved, will require a step change in housebuilding rates. It will also need two recession free decades. The danger is that if we put high targets in our local plan, planning inspectors will hold us to that. If we can’t identify enough sites where housing can be delivered in the five years ahead, the inspectors will approve housing almost anywhere, whether its welcome or not. It is worth noting that there is planning permission for around 11,000 dwellings in Shropshire that have yet to be built. The government is proposing a new way of calculating housing need. That suggests that Shropshire needs to build 1,270 homes a year, not the 1,430 the council is proposing. The Office of National Statistics estimates that the number of households in Shropshire is set to grow by around 940 a year. For Ludlow, the proposals give us a relatively small increase in housing. That reflects that we have already approved more dwellings than allocated in SAMDev for the town. Our biggest issue is that very little is being built. We have four or five small sets of housing being built, and the large retirement at Stone House. But most of our larger sites are up for sale: Foldgate Lane (137 homes); Bromfield Road (215 homes); Fishmore Road quarry (100 homes); and Sheet Road (80 homes). That’s more than 500 homes with planning permission or about to get it that the landowners and developers don’t want to build. In 2016/17, we built 14 homes in Ludlow and Ludford. Under the new proposals, we will have to deliver 50 a year. We also need to build the right type of homes. That means smaller homes for sale and affordable housing. The developer behind the Fishmore Road quarry application is arguing that the site is unviable if any affordable housing is included in the scheme. Foldgate Lane got through the planning system in part because it is offering 25% affordable housing. I will believe that when they are built. Once the site is sold, the new developer is bound to start discussions on viability and reducing the level of affordable contribution (see Telegraph report). Click on the image to enlarge. Or download a PDF. If we are to go for this level of growth, it should be underpinned by some visionary concepts, such as are being sketched out for the east-west corridor from Oxford to Cambridge. There is little sign of that level of innovative thinking in Shropshire. The council seems to be holding its light under a bushel over this consultation. It’s not mentioned in the council’s newsroom and you need to know where to look to find it. You’ll find it here. The consultation is open until 22 December 2017. This is the second in a series of posts on the local plan review.
. Source: Live tables on dwelling stock.
. Under the National Planning Policy Framework, if a planning authority cannot demonstrate a five-year land supply for housing, the presumption in favour of sustainable development kicks in and housing can be built anywhere deemed ‘sustainable’.
. Permission has been granted for the former Whittle site on Fishmore Road but the larger quarry area application has made no progress after 15 months. Where are the jobs going to be that will attract so many new residents to Ludlow? So far, the town appeals mainly to the older house-buyer, while younger folk look for opportunity in the cities. When these jobs are created, is there going to be transport to and from the day’s work, or, even, school? Do those doing the planning know what Ludlow is like? Or Rocks Green? Wouldn’t these questions take longer to answer than it takes to put down the paper and pencil decisions that look so optimistic?